Nationwide Industrial Supply offers one of the largest selections of material handling and drum handling equipment in North America. 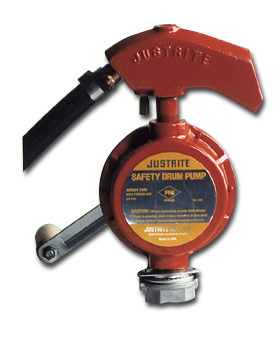 Drum pumps provide dispencing of drum contents to meet standard and specialized requirements. Non-toxic, non-sparking and self-priming pumps 600 GPH materials in contact with food are Delrin, Buna-N, Silicone and Stainless Steel. FOB Shipping Point. All pumps include 5' of discharge tubing. For use with acids, alkalies, chlorines, detergents, waxes, etc. Call for chemical compatibility. FOB Shipping Point. 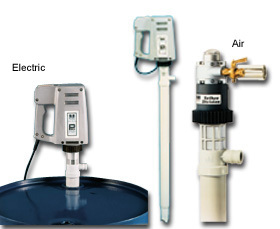 Pumps are capable of a 12' suction lift and 12' of head. Designed for enduring use. FOB Shipping Point. 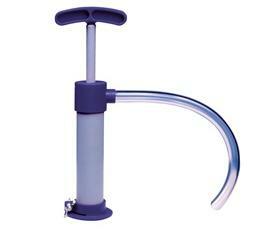 It's tough PTFE piston and stainless steel suction tube delivers up to 16 oz. per stroke for efficient performance. 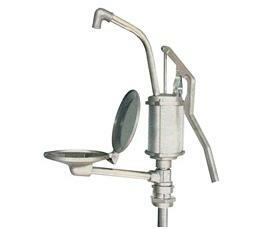 Includes 2" IPS adapter for fitting 15, 30, and 55 gallon drums. Also available in chrome plated steel, 16 oz. per stoke with a polyethylene piston. FOB Shipping Point. 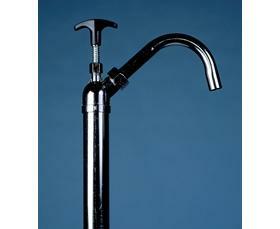 Steel and aluminum, telescoping intake tube from 22" to 39". 3/4" inlet and outlet delivers approx. 1 gal. per ten strokes. Longwearing. FOB Shipping Point. 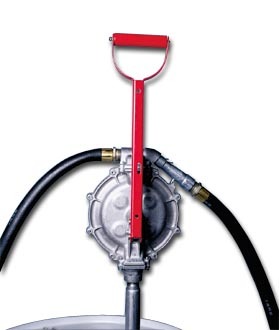 Air operated for use with motor oil, gear oil transmission fluid pumps up to 10 GPM. 1:1 pressure ratio between inlet and outlet. Comes with 2" bung adapter. FOB Shipping Point. 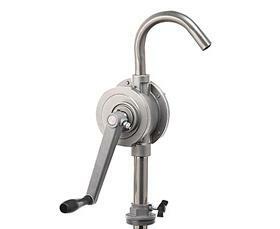 <B>Stainless Steel Pump<BR></B>Ideally suited for acids and corrosive chemicals. 316 stainless steel piston construction with&nbsp;PTFE components for strengthened resistance. Dispenses 8 oz. per stroke. 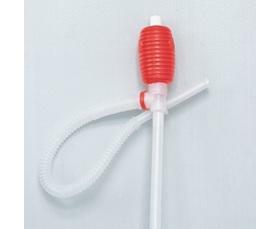 Includes 22" PTFE extension tube and plunger. Delrin bung adapter. Optional pail adapters. FOB Shipping Point. 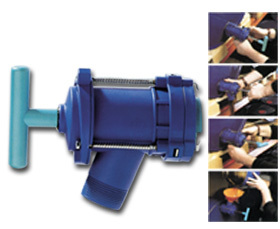 <BR><BR><B>Steel Pump<BR></B>Economical and durable pump for use with detergents and other liquids compatible with steel and polyethylene. Efficient 8 oz. per stroke. Comes with 22" polyethylene extension tube and piston. Optional pail adapters. FOB Shipping Point. 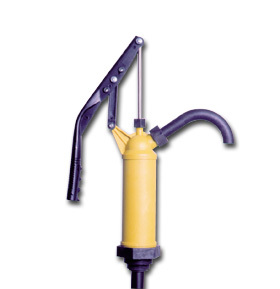 Ideal for dispensing gasoline, diesel fuel, and similar petroleum products. 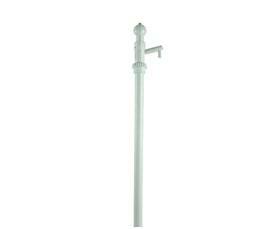 Steel and aluminum comes with telescoping tube assembly. Delivers approx. 1 gal. per 8 strokes. FOB Shipping Point. 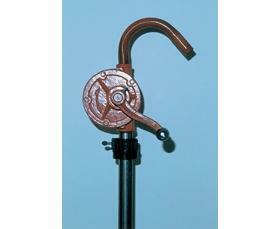 Sturdy hand crank delivers 6 GPM. Includes 1-1/4" x 40" long 3-piece O.D. 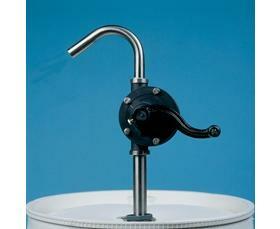 stainless steel discharge set and 2" chemical resistant coated bung adapter. Viton lip seal and O-rings. FOB Shipping Point. 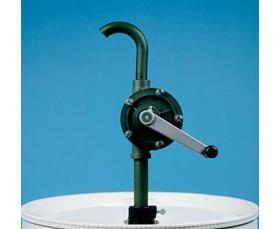 Returns drips and overflows through strainer back into drum. Rugged&nbsp;aluminum and steel construction. 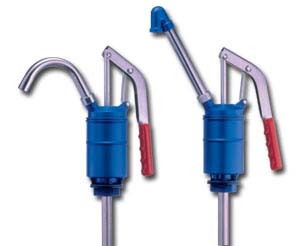 3 piece suction tubes for use in a variety of drum sizes. 2" bung adapter included. FOB Shipping Point. Standard Straight Spout. Approx. 15 oz. delivery per stroke. Anti-pumping/child safety device. 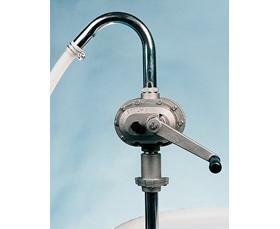 Outlet spout swivels to prevent drips. 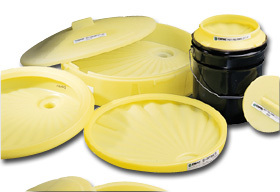 Full range of drum attachment fittings available -- call dealer for more information. Suitable for drum sizes 5 to 55 gals. FOB Shipping Point. 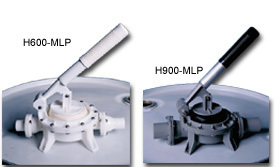 Series <b>H07600</b> have built-in pressure and vacuum relief venting. 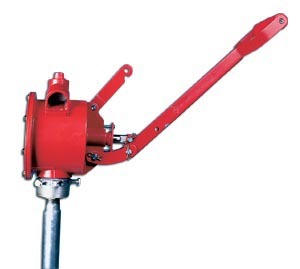 Rotary style is ideal for non-corrosive chemicals, petroleum and general solvents. <b>H07610</b>, 8' hose and <b>H07620</b>, 6' hose have intergral bonding wire. <b>H07630</b> has threaded spout and return tray. Piston style suitable for acetone and keotones. FOB Shipping Point. 6"L. brass flame arrestor screen prevents flashback ignition and hinged cover reduces the spread of hazardous vapors. Equipped with fusible link that melts at 165&deg; to automatically close cover shut. Measures 10-3/4"dia. x 10"H. Mouth is 10-3/4". FOB Shipping Point. 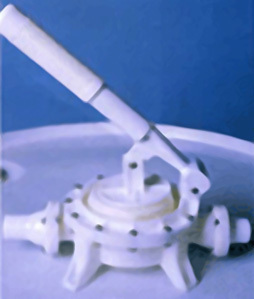 <b>Poly-Funnels</b>...large capacity funnels allows multiple oil filters, cans and pails to drain at once. 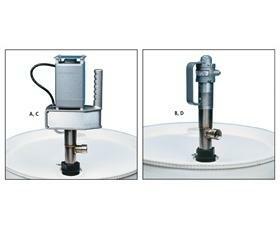 Big pouring area eliminates overspills and keeps drum heads clean. Ideal for automotive repair, transferring industrial cutting fluids, farm pesticides, laboratory reagents, etc. FOB Shipping Point. 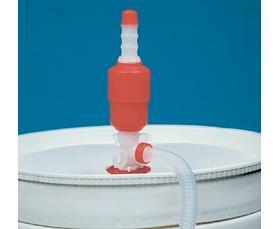 <b>Poly-Funnel 55</b>...the original POLY-FUNNEL has a large pouring target and fits 30 and 55 gal. drums, steel or plastic. <b>Poly Safety-Funnel</b>...comes complete with a flame arrestor for those flammable jobs. 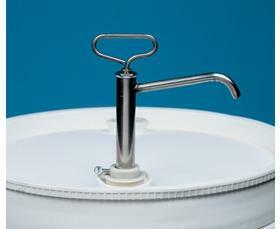 <b>Poly Funnel Plus</b>...ideal for small head drums where pouring can be difficult. 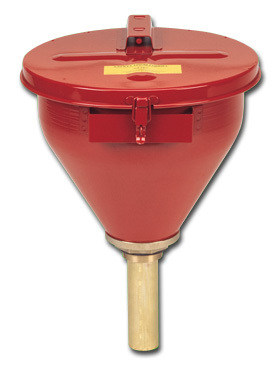 <b>Safety-Funnel Plus</b>...with the tall sidewalls to protect against splashes and sloshes as well as a flame arrestor -- perfect for funneling flamable liquids. 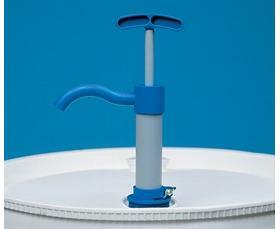 <b>Poly-Pail Funnel</b>...for tight-head and open-head pails. Promotes active waste collection because pails may be safely carried between generation and collection points with the unit in place. 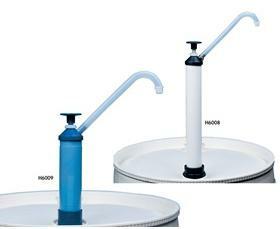 <b>Poly Funnel Tall</b>...the tall sidewalls will better handle splashes and messy sloshes. Added sidewall height allows T-Handle Stop to fit securely under the lid.